SAUTER upright pianos offer a brilliant sound, sensitive touch and great expressivity. We build pianos for the concert hall as well as your home. To ensure that your piano harmonizes with your personal lifestyle, we place a strong emphasis on design and particularly value form and workmanship. Experience clarity of sound. Regardless of which model you select, SAUTER upright pianos inspire the joy of music. Interior designer Peter Maly designs pianos that harmonize with today's living environments. In technical terms, these models are nearly the equals of the Master Class. The first-rate technical excellence of our piano factory is characterized by particular values and high-quality features such as the sostenuto pedal (a SAUTER innovation), which helps to achieve the nuanced performance of a grand piano. The ideal enhancement for your Sauter instrument. This advanced silent system makes a real impression with its realistic piano sound and specially designed muting feature. 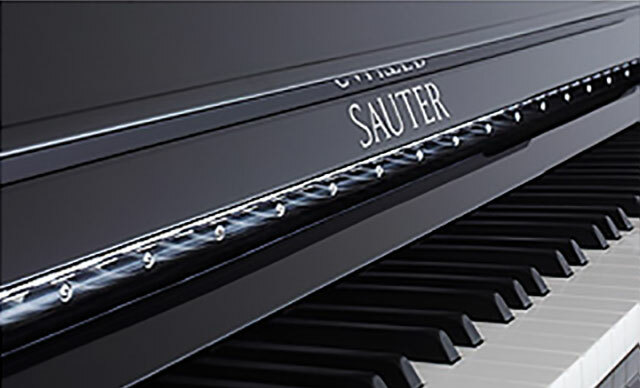 Discover the remarkable sound of the 1/16-tone upright from SAUTER. Functional, sophisticated and of high quality, our piano benches meet the highest standards of esthetics and craftsmanship.